Coachella 2019 takes place across the weekends of April 12 – 14 and April 19 – 21. The lineup of musical stars and talent is exciting as always with performers such as Tame Impala, Childish Gambino, Ariana Grande, and so many more. There are always plenty of on-site events and off-site parties during Coachella. This year, highlights include the Records and Record Store Day, Coachella Art Studios, Neon Carnival 2019, and Day Club Palm Springs 2019. Wherever your weekend takes you, Drip Hydration is your mobile IV hydration solution during Coachella 2019. Our nurses are on-call to deliver IV therapies directly to you to help you stay hydrated and hangover-free. Why Get IV Treatments for Hangovers and Dehydration? IV treatments quickly detoxify harmful buildups in your body that are produced by your liver, rehydrate your body, and restore vitamins and nutrients that are lost between drinking, dancing, and sweating. You can prevent dehydration and hangovers with one fast and convenient treatment. If you already have a hangover, don’t fret – our Hangover IV will bring you relief from your symptoms within an hour of treatment to help you get back to enjoying your weekend. IV fluids take between 30 minutes and 1 hour to administer, making this treatment a fast and efficient option so you can get to what matters most: the music and a truly memorable weekend. Drip Hydration will have nurses on call at Coachella to help individuals, groups, and entire parties stay hydrated, refreshed, and energized all weekend. Our nurses come to you wherever you are for your convenience. 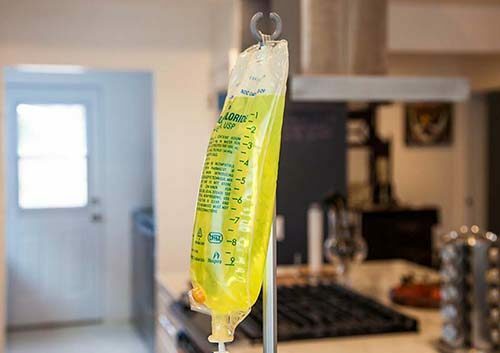 We’re also offering direct-delivery IV packages for AirBnB guest houses and AirBnB Events. Every IV contains a base of 1 Liter of IV Fluids and electrolytes. Additional ingredients vary depending on which package you choose. Vitamin B12: A B-Complex vitamin that boosts energy levels, which helps sustain your endurance for dancing, standing, and making the most of the festival. B-Complex Vitamins: A complex of 8 different vitamins that perform a range of vital functions, especially helping your body convert food into the energy you need to fully enjoy Coachella. B-Complex Vitamins also provide cardiovascular support that help keep your circulation flowing normally, reduce fatigue, and help your kidney and liver process the toxins produced by alcohol consumption. Vitamin C: A vitamin that plays many essential roles throughout the body, helping to maintain a variety of systems. Vitamin C improves circulation, which is helpful with prolonged standing at Coachella, reducing fatigue, and also helps keep your kidney and liver functioning at top performance. This antioxidant reduces the free radicals in your body that are produced by drinking. Magnesium: Magnesium is a mineral involved in over 300 biochemical reactions throughout the body. It plays a large role in regulating the cardiovascular system, which can help maintain healthy circulation, which in turn reduces fatigue. Glutathione Push: A highly concentrated dose of glutathione, a powerful antioxidant that detoxifies the body and removes free radicals produced by drinking. Glutathione also boosts energy levels to help power you through the festival. In addition to these ingredients, we also offer IV add-ons such as anti-inflammatory medication to help with headaches, muscle aches, and hangovers, or anti-nausea medication to help your stomach feel better after drinking. Our B12 shots, meanwhile, are a quick and effective way to boost your energy levels and help keep the party going all night. Regardless of which weekend you attend, Coachella can sometimes feel like an endurance event. Music, dancing, drinking, long days and late nights, and spending time in the sun all combine to create a marathon for your body. These same factors also contribute to dehydration and hangovers, which can leave you feeling too tired to fully enjoy yourself. IV hangover therapy and hydration can help ensure you feel your best during Coachella. Individuals can book a mobile IV treatment in advance or on-demand. Our nurses will come to you wherever you are staying during the festival whether you’re camping on-site or booking a room off-site. If you’re partying with a group, you don’t have to put your celebration on hold to rehydrate and re-energize. With our group bookings, a nurse will come to you wherever you are staying at the festival to provide IV treatments for you and your friends. Are you hosting an event or having a party and want to have a nurse on standby all weekend? We can arrange to have a private nurse stationed at your lodgings for the duration of your event. Our nurses are also available for IV treatments on-demand. Ready to book your IV Hangover and Hydration therapy for Coachella 2019? Or do you have questions about how our treatments work? Give us a call. We’re happy to answer any questions you have about Drip Hydration and our service offerings.